The annual Fete and Donkey Derby was held on 29th August 2016, and for the first time in two years, Godstone enjoyed a warm, sunny and dry Bank Holiday! The fete was officially opened by the recently installed Reverend Peter O’Connell, who by the way could later be seen working hard at marshalling the many cars that arrived to enjoy free parking on the Green. The Godstone fete is always popular but this year the fine weather brought huge crowds of cheerful people throughout the day to enjoy the many stalls and attractions. Car parking was extremely well organised and this year there were many stalls appearing for the first time. The wide variety of stalls included jewellery, crystal ornaments, lovely wood carvings, books and puzzles, jams, pickles, second-hand curios, gardening equipment, toys, paintings, and at one stall visitors could have portrait photographs taken of their dogs. Godstone organisations were also represented, including the Baptist Church, St Nicholas Church, Godstone Village Association, Age Concern, and for the first time, the Gardening Club joined in and had a spectacular stall which was designed to attract new members. It was put together by members and was very original and most attractive. The Caterham, Oxted and Godstone Lions Club started to supply bacon sandwiches as the fete opened and continued trading until its volunteers ran out of supplies well before the end of the day. In fact, by 2:30pm the Lions had no food left to sell, such was the demand. The Lions had brought along more than ever before and a member said they had sold 315 hot dogs, 600 burgers, 10 kilos of bacon and 15 kilos of fried onions. In terms of drinks they sold 346 cans, 15 litres of orange and apple juice, 30 litres of lemonade and coke. Pots of tea used 220 tea bags and 24 pints of milk. This was double what they had sold in the last two years; and all that in addition to their candyfloss and popcorn sales! The crowd was treated to a fine display of gymnastics put on by High Vaultage, followed by musical entertainment by the Dave Weir Jazz Band. Many also enjoyed the Dog Show organised by the Epsom Canine Rescue to raise money for their worthy cause. There was a merry-go-round for little ones, bouncy castles, a lovely fairground organ, the Tandridge Photographic Society displayed some beautiful historical photographs of Godstone village life, and the ice cream vans were also very popular. As the event went on and the crowds increased, the Donkey Derby races started and as always were well supported by businesses and organisations in the village, each donor choosing a name for a donkey in each race. The races were great fun and as always enjoyed by everyone. At one time the skies darkened with heavy clouds and some thought rain was on the way but the ominous skies swiftly cleared, the sun returned and the fun carried on. 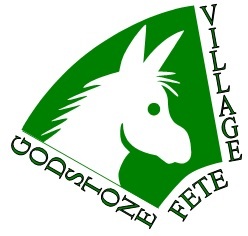 There is no doubt the Godstone Fete and Donkey Derby is one of the highlights of the year not only for the local area but also for many visitors who come from much further afield. The organisers wish to acknowledge and thank Fran Pavely for her report and photographs of the event published in the local Surrey Mirror newspaper. We hope to see you at the next event in August 2017, planning for which is already underway! A presentation evening was held at the Godstone Village Youth Centre in early December to distribute the proceeds of the Fete in the form of grants to local organisations and charities, and as a thank you to all those that contributed to the success of the event.